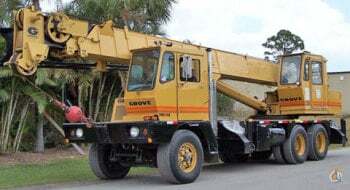 2002 Grove GMK7550 equipped with: 53 ft.-197 ft. 5 section full-power boom with Twin Lock boom pinning system, 82 ft.-259 ft. luffing jib, main & auxiliary winches, 264,500 lbs. counterweight, Mega Wing Lift option with an additional 88,200 lbs. counterweight, multi-position outriggers-29 ft. 2 in. span, boom removal system, hydraulically tiltable upper cab with heater & air condition, armrest joystick controls, ECOS & EK5 LMI system, 2 man lower cab with heater & air condition, 14 X 6 X 14 drive, MegaTrak suspension, all-wheel steer, Allison 4800SP automatic transmission, Mercedes OM906LA diesel engine-279 HP-upper, Mercedes OM502LA diesel engine-563 HP-carrier, Tires: 525/80R25-80%. 3 sheave 80 ton block, 5 sheave 125 ton block, & 9 sheave 250 ton block. 12,736 hours on upper, 41,926 miles & 3,294 hours on lower. Good condition with a current certification. Boom/Jib: 197 ft. / 259 ft.